Alvo, don't feel bad and I love your typo of "clown tool" as I'm sure sometimes it must feel that way. I like the clone tool for small jobs, but like using layer masks even better. Enjoy your trip and sometimes it can be beneficial to walk away and then come back to your photo. I don't know if this is the right place to post this or not but I felt like it needed posting. I have found out thru the years that I am not unique, if I am doing something then you can bet lots of others are doing the same thing. I learned a method of setting white balance on YouTube where you go into curves, hold down Alt and select the auto button. This brings up a dialog box where you can select to let curves automatically select your Black and White points. I guess I should have learned on my first photo when Jo Anne pointed out the colors were wrong but I must be a little more hard headed than I thought. After trying every color adjustment tool I could think of to try and match Jo Anne's colors in the coveralls I had this brilliant idea. Why not go back to the original and do a manual white balance. When I did, Bingo, I hit Jo Anne's colors. I even tried an auto white balance and got the same thing I got using auto in curves. I will NEVER use anything auto again while setting a white balance. I haven't quite ya'll, working on those strips..
Do you think the circled fold in red will be dark or light blue? If you look at the other folds (and you could do searches online of other similar pictures to confirm) I think you will see light on the outside and dark on top and bottom where it's in shadow. Such as this and this. Think about where the light appears to be coming from and where it will be blocked by something in the image and you'll generally be able to match up the damaged areas to the rest. You've made tons of progress and I'd say the end is in sight. Are you looking for input on the cleanups remaining or just showing off those lovely stripes (and your hard work)? I did markup on your latest WIP to show the areas that need attention. If you look at the saturation of the blues & cyans in my version I've taken away the glowing colors (a Hue/Saturation adjustment layer just for blues and cyans). Thank you very Much, I will get back on it after Thanksgiving. Hope you and yours have a Happy Thanksgiving along with the rest of the folks of OPR. Jo Ann, Corrected per your suggestions plus some.. I still see some of the items I marked the last time need attention in the most recent work in progress, but you're closing in on the finish line! Hmmm, I put your mark up photo in PS along side my WIP. As I made corrections I put a red check mark in each circle. All the circles are checked so I made some kind of adjustment at each one plus some you didn't circle. Please indicate what areas you are speaking of so I can go back and look. If it is the inside of the ear there was some orange in there from somewhere and I took that out, otherwise I am not sure what to do with the ear. Thanks. 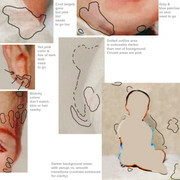 See if this set of "excerpts" from the image helps you spot the areas that need just a little more attention. When I layer your latest over your last, I can see you made some changes, but just not all of them - so on the socks, for example, you cleaned up some of the marks in the circled area, but it's still pink instead of white. In the background areas, you did make fixes, but you still have dark areas that don't match the rest of the background. I've made the patches 200% size to try and make things easier to see, but I've only marked up the things that really stand out when you look at the photo actual size. Getting rid of the gray, blue, pink and orange blotches on the face is more important that other areas as the face is what the family will notice the most. To try and show the background areas that are different, I've included a smaller version that is more contrasty as it helps outline where you need to blend the darker with the lighter colors. Also, I notice that your current image has the Adobe RGB color space where the original and your earlier WIP versions were sRGB. Not sure how that happened, but the color space must stay the same as the original damaged image. OK, thanks, this helps a lot. I thought the dark spot in front was a shadow, I blended with the healing brush but looking at the original now I can see what you mean. Back to the drawing board..LOL I am not sure how the grey splotches got in the face, is this something from the clone tool? ?